Page 1 - Play Today | KaBOOM! Rhian Evans Allvin: Neuroscience has confirmed that learning begins at birth and the period from birth to age five includes rapid brain development–setting the foundation for cognitive, social/emotional, language and fine and gross motor skills. In order to achieve the academic excellence and equity that is essential–we must invest in our young children during this window of explosive development. Young children engage in various kinds of play, such as physical play, object play, pretend or dramatic play, constructive play, and games with rules. Play gives them opportunities to develop physical competence and enjoyment of the outdoors, understand and make sense of their world, interact with others, express and control emotions, develop their symbolic and problem-solving abilities, and practice emerging skills. Research shows the links between play and foundational capacities such as memory, self-regulation, oral language abilities, social skills, and success in school. Children of all ages love to play. From infancy, children act on the world around them for the pleasure of seeing what hap¬pens; for example, repeatedly dropping a spoon on the floor or pulling the cat’s tail. Around age two, children begin to demonstrate symbolic use of objects–for instance, picking up a shell and pre¬tending to drink as from a cup–at least when they have had opportunities to observe others engaging in such make-believe behavior. From such beginnings, children begin to engage in more mature forms of dramatic play, in which by the age of 3–5 they may act out specific roles, interact with one another in their roles, and plan how the play will go. Such play is influential in developing self-regulation, as children are highly motivated to stick to the roles and rules of the play, and thus grow in the ability to inhibit their impulses, act in coordination with others, and make plans. High-level dramatic play produces documented cognitive, social, and emotional ben¬efits. Darell Hammond: As global competition increases, it is imperative that children develop a skill-set relevant to today's workforce and are able to approach challenges with creative solutions to successfully navigate our complex, ever-changing world. Critical thinking and collaboration are integral to the jobs of the future, and balanced and active play helps kids develop these 21st century skills. Unfortunately, however, play is disappearing in our schools. A study published in the journal Pediatrics found that 30 percent of children surveyed had little to no recess in their school day. That's nearly one in three kids. At KaBOOM!, we believe play should be part of a well-rounded school day. That is, kids need to read, write, do math, as well as practice problem-solving, teamwork, and creativity. We know play also helps children adjust to the school setting, enhances their learning readiness, and indirectly contributes to children learning more hard skills in school by mitigating behavioral problems and increasing academic engagement. Rhian: We see a wonderful interplay of domains as children play–they demonstrate their approaches to learning, they can engage with others in a social relationship, they attempt things that are challenging, yet achievable–which enhances their self-esteem. Children express emotions as they play. There’s also an integration of math, literacy, science, and other academic areas as children play–constructing, classifying, sorting, seriating, quantifying, and practicing other skills. Physical play supports the development of gross and fine motor skills. Who knew that a classic game of Simon Says is actually building the same inhibitory control that is needed to follow academic instructions later in school? 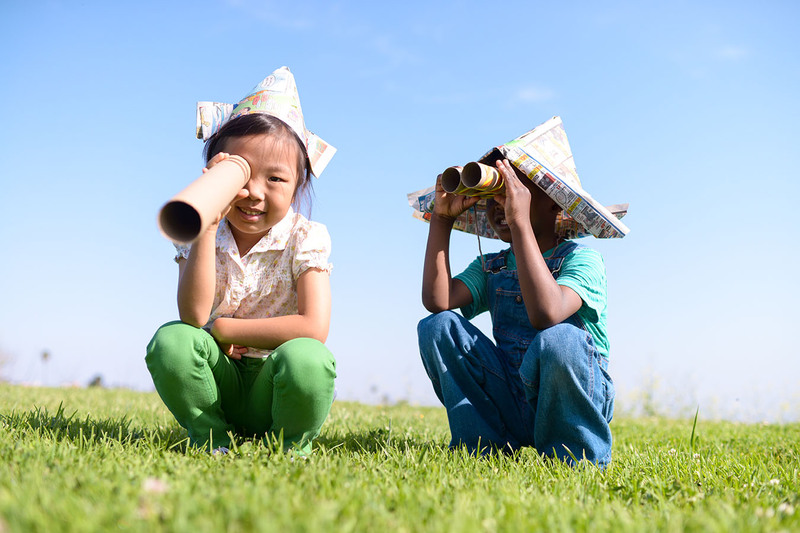 Research now demonstrates the development of self-regulation or executive function in sociodramatic (imaginative, pretend) play leads to higher achievement–a very important benefit! Darell: At KaBOOM!, we believe that the well-being of society begins with the well-being of children. This is why we’re such big advocates of balanced and active play, which is essential–and elemental–to enable children to thrive. Just as a healthy diet balances proteins, fats, carbohydrates, and other nutrients, a balanced “play diet” should include a mix of all kinds of play, because different types have different benefits. For example, play-dough creations, blocks, and make-believe spark the imagination and teach problem-solving skills. Running, jumping, and climbing get legs moving and hearts pumping. And exploring playgrounds with families or playing hide-and-seek with friends helps kids learn to work together, collaborate, and share. A balance of play means active minds, active bodies, and active together to realize all of play’s benefits. Darell: Across the United States, cities and communities are engaged in a fierce contest for the future. They are competing for businesses, economic development, and jobs. They are competing for residents–for families who will breathe energy and enterprise into their neighborhoods. The fact is, for communities to thrive, they need to ensure that all of their residents are happy, healthy, and contributing to their community’s overall vitality. One essential ingredient in the recipe is a renewed commitment to fostering family-friendly, kid-friendly environments that allow young people to get their bodies moving and their minds engaged no matter where they are. All families deserve to live in a safe community with ample job opportunities, great schools and abundant opportunities to play, but we currently have inequitable distribution of services, resources, and opportunities for low-income families. This inequity serves to perpetuate the cycle of poverty that threatens our nation's economic future. Creating kid-friendly, family-friendly cities filled with play is a competitive advantage for cities to attract and retain residents, and it directly impacts the kids that need it most. Rhian: The provision of family-friendly, kid-friendly environments is a hallmark of sustainable communities. All families want to live in areas where there are many opportunities for children to play outdoors in areas that are safe and conducive to big body play, using their imaginations and equipment that is tailored to their needs. That’s the kind of community I want to live in–and fortunately I do! Play is disappearing in schools. Schools are cutting back on recess and even eliminating it altogether to focus on classroom instruction. 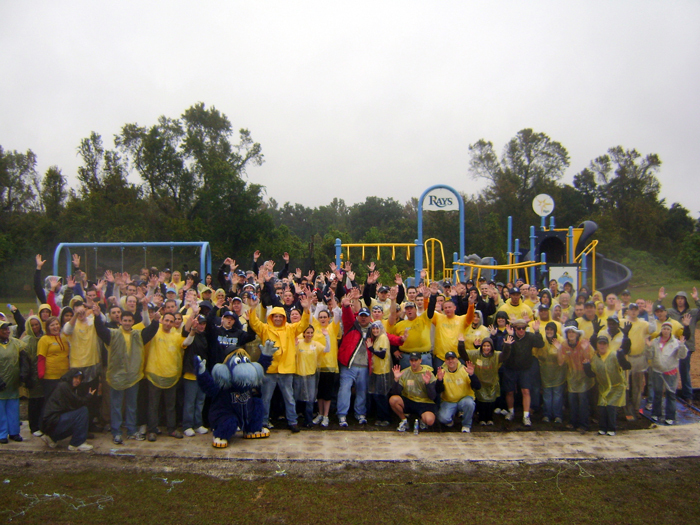 As TODAY recently reported, this is the case for about 23 elementary schools in Orange County, Florida, which has led parents to take a stand for their kids' right to play. At KaBOOM!, we believe play should be part of a well-rounded school day. That is, kids need to read, write, do math and practice problem-solving, teamwork, and creativity—all of which are skills fostered through play and are essential outcomes promoted by Common Core standards. From helping kids adjust to the school setting to enhancing their learning readiness, behavior, and 21st century skills, play enhances a child’s education. Studies show play may also increase children's capacity to store new information, as their cognitive capacity is enhanced when they are offered drastic changes in activity. A 2010 study published in the Journal of School Health concluded that recess "serves a necessary break from the rigors of concentrated, academic challenges in the classroom." According to evaluation findings on Playworks from Mathematica Policy Research and Stanford University, strengthening recess transforms the school environment, paving the way for more focus on learning. Innovative communities across the country are taking steps to incorporate play citywide because they understand it is critical to a great education. Chicago is rebuilding 300 school playgrounds and, alongside additional instruction time for students, guaranteeing 45 minutes every school day for children to play before returning to the classroom ready to learn. Nashville also believes increased play can help boost youth academic achievement, health and socialization. As a result, Mayor Karl Dean has initiated joint use agreements to open school playgrounds to the public after school hours, on weekends and during the summer. Play and learning shouldn’t be viewed as opposing principles, because in fact, play and learning go hand-in-hand. We applaud the efforts and actions taken by parents, schools and communities around the country, and encourage others to implement holistic instruction, which includes play. By equipping kids with the 21st century skills they need to thrive, we are also ensuring our nation’s future well-being and prosperity. Do you think schools should include time for play? Let us know what you think on Twitter (twitter.com/kaboom) using the hashtag #playmatters. Kids need balanced and active play to thrive. Originally posted 12/8/2014 on the NetImpact.org blog. At this year's Net Impact Conference, I participated in a session - Good at Doing Good - that explored what makes a nonprofit a successful, high-impact organization able to create and sustain lasting social change. As founder and CEO of KaBOOM! 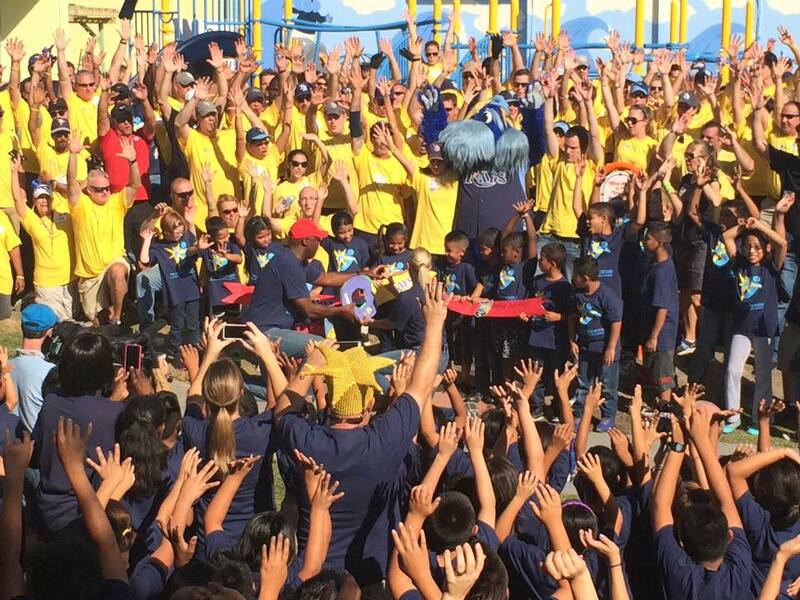 - the national nonprofit dedicated to bringing balanced and active play into the daily lives of all kids - I am proud of the impact we've had building more than 2,500 playgrounds in 18 years in communities all across the country. However, we at KaBOOM! also recognize that we cannot scale our organization to build enough playgrounds to address this challenge at the scale it exists in society, particularly for the 14.7 million American kids growing up in poverty. Over the past two years, we've set a course to scale our impact without scaling the size of our organization in an unsustainable way. 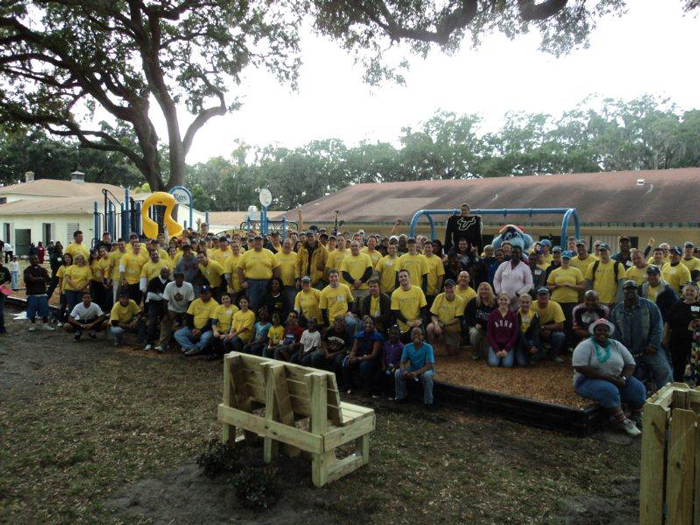 We are seeking outsized social returns by pursuing an influence strategy aimed at community-wide change that complements our direct impact work building playgrounds with low-income communities. In particular, we are focusing on driving cities to create kid-friendly, family-friendly communities that benefit all kids. Cities are critical to achieving society-level scale because most play-related infrastructure investments, policies, and programming happen at the local level and because cities, as the government of last resort, are becoming hotbeds of innovation to solve intractable social problems. To drive change at the city level, we have positioned ourselves as standard - setters, not policy advocates. In other words, we are not pushing a policy agenda on cities, but rather creating a national platform for cities to implement their own big ideas for using play as a solution to their pressing challenges. Playability - the extent to which cities make it easy for all kids to get balanced and active play - can take many forms and address many challenges. For example, Brownsville, Texas, is bringing play opportunities to low-income neighborhoods in order to improve economic prospects in struggling neighborhoods. Meanwhile, Spartanburg, South Carolina, is planning to harness its under-utilized waterways as a competitive advantage to attract and retain families of all income levels who want abundant opportunities to play. Investments in play will not be successful unless they lead to widespread behavior change. To inspire cities to generate solutions that overcome behavioral bottlenecks that keep kids from getting the play they need to thrive, we partnered with ideas42, a nonprofit that uses behavioral science to solve large-scale social problems. Among the findings from ideas42, we learned that cities need to put play everywhere, integrating play into dead time and dead space. In addition to playgrounds, we are encouraging cities to reimagine how everything from sidewalks and bus stops to grocery stores and health clinics can be filled with play, making it easier for families to prioritize play for their kids. These are places where low-income families are already spending significant, often frustrating time together. By embedding play everywhere, cities can turn these moments of frustration into moments of play-filled joy. All families deserve to live in a safe community with ample job opportunities, great schools, and abundant opportunities to play, but we currently have inequitable distribution of services, resources, and opportunities for low-income families. This inequity serves to perpetuate the cycle of poverty that threatens our nation's economic future. As we inspire cities to embrace Playability and implement Play Everywhere ideas, we need to ensure that play is used to address inequity, not exacerbate it. As walking and biking have taken off in cities across the country, they have tended to benefit those with means. For example, of the 70-plus miles of bike lanes in our hometown of Washington, DC, zero are in Anacostia, the part of the city with the highest concentration of poverty and kids in poverty. Consistent with our mission, it is our responsibility to ensure that cities do not follow a similar path when it comes to play. Driven by our mission to improve the lives of kids growing up in poverty, we are impatient by nature. Our goal is to make societal change happen in the next decade, not the generations it has taken to gain traction on walking and biking. To get there, Playability requires a different approach to philanthropic partnership. Partnerships of this kind are not easy, especially because the business of philanthropy is so risk-averse. It is easier to stick to what you know and do well, even if it cannot achieve scale. It is safer to fund small, tangible projects than to provide significant flexible resources that have the potential to achieve society-level change. At KaBOOM!, we are fortunate to have partners that do not shy away from a challenge and encourage us not to rest on past success. We invite others to join us to ensure that all kids get the childhood they deserve filled with balanced and active play, so they can thrive. Mayor Rahm Emanuel and his administration are part of a growing number of city leaders across the country who recognize the importance of play in creating vibrant communities. Young adults have flocked to active cities like Chicago that have created walkable and bikable communities. Chicago understands that to keep these adults once they become parents, it must prioritize playability — ensuring a kid and family friendly community that not only gives kids the active and balanced play they need to thrive, but also retains residents and supports local businesses. Play matters to child development — it’s a muscle-builder, brain-expander and friend-maker. And for kids who face extreme adversity — depravation, neglect, abuse, exposure to violence — play can protect against toxic stress, which hinders healthy brain development. That is why I applaud Chicago for committing to the ambitious goal of ensuring that all kids in Chicago live within a seven-minute walk to a park or playground. Chicago has also extended the school day to bring back recess, physical education, and the arts. City leaders are working in tandem with community groups and the private sector to ensure that the play needs of all Chicagoans are met, in all neighborhoods. Leading cities are also innovating to push the play boundaries beyond the schoolyard and the playground, enabling play to happen everywhere. 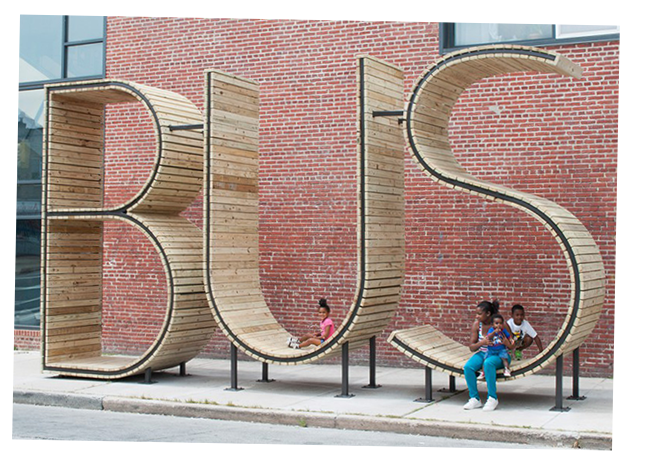 Consider how Baltimore replaced a traditional bus stop shelter with giant climbable letters that spell BUS, turning an everyday space normally associated with waiting and frustration into a joyful play space that kids love and parents value. In Chicago, the city is experimenting with People Spots — temporary, pop-up parklets adjacent to sidewalks, typically within existing parking lanes. By expanding the sidewalks, they create seasonal space for outdoor gatherings and family playtime. As a placemaking tool, People Spots increase foot, bike and stroller traffic. As a result, local store owners report a 10–20% increase in revenue, according to metroplanning.org, just one example of the economic benefits of playability. By reclaiming public space for kids and families, and integrating play into their daily lives, Chicago and other leading cities are making it easier for kids to get the play they need and setting them on a healthy and successful path. That's why on October 23 and 24, KaBOOM!, with the generous support of Humana Inc. and the Humana Foundation, will host its Playful City USA Leaders Summit in Chicago. A dozen teams from cities across the country — from San Francisco to Spartanburg, SC, and from Pittsburgh to Providence — will join the host city's team to build momentum for their bold goals and big ideas for transforming their communities into kid and family friendly cities filled with play. Ben Hecht, CEO of Living Cities, who will be participating in the Playful City USA Leaders Summit, agrees that play has a role in thinking about urban development differently. Play is no longer an individual responsibility, he says. It is a societal and community responsibility. Mayor Emanuel and the City of Chicago, along with other cities heading to the Summit, are demonstrating that playable cities are the cities of the future. Enjoy this guest post from our friends at Doozy, a life-sized board game that inspires people to get outside and create their own play, about the importance of creative and imaginative play! When did you last play a game - at a social event, on the bus, at work? Now really think, when did you last let yourself go, make things up and build creatively with others? We want the latter to be more than a distant memory. The harsh reality is that people are spending, on average, more than 7 hours a day in front of a screen, and most play and entertainment now involves a screen too. Our mission is to inspire people to get outside and create their own play through the framework of a life-sized board game. Doozy lets you be your own game piece and flex your creative muscles as you hop from space to space completing challenges with other players. So how does it work? You take the circular spaces and create any closed loop of your choice (the goal is to get back to the start). You roll the die, go to the next space of that color, draw a card, and you do what it tells you to do. The card challenges might ask you to grab a partner and “wheelbarrow” around the board, switch shoes with someone, or even act like a taco! But what really sets Doozy apart is that you have the power to change the size of the board, the rules of the game, and the challenges that fuel it. We trust you to bring your own quirks and ideas to Doozy and customize it to your playful needs. As players become co-creators and invest themselves in the game, they inherently internalize Doozy’s larger message and make more time for play in their daily routine, high fiving co-workers, getting outside for lunch, and being that much more playful. When we introduce Doozy, we use the word framework because ultimately it’s not about the game itself but rather the idea that Doozy can be a bridge; a bridge between the prescribed play of a digital age and the kick-the-can, baseball-meets-freeze tag experiences we had growing up; a bridge between caring adults and children, bosses and employees, new friends and old. The idea that players are creators is reinforced by the rewards of our current Kickstarter campaign, where you can simply take the idea and run with it, download and print the cards, make the spaces, or have it all manufactured and delivered to your doorstep. Because ultimately, we won’t be the ones to design Doozy 2.0 – you will! We want to spark a movement but we can’t do it alone. Let’s set an example so this generation of kids grows up with the balanced and active play they need to thrive. We want to see kids growing up differently: talking with that other person in the elevator, moving their phones a little further away from their bed, and spending more time playing than in front of the TV. 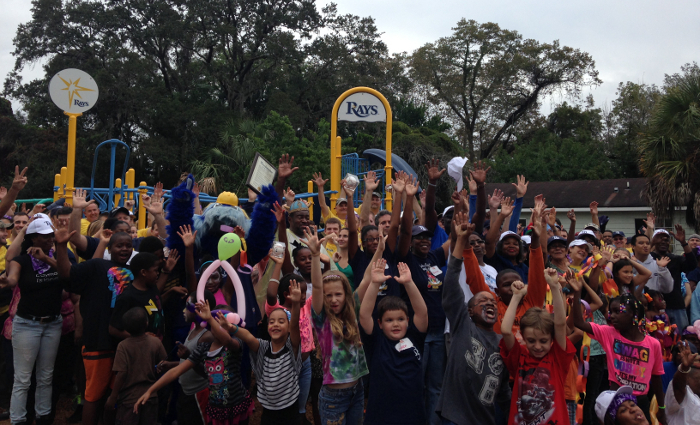 With your help, we can bring play back for kids and adults! "About a decade ago, the so-called creative class of 20somethings fueled the revival of urban centers by settling in downtown areas mixing condos and coffee shops. Now, as millennials and other urbanites have children, their needs are changing. 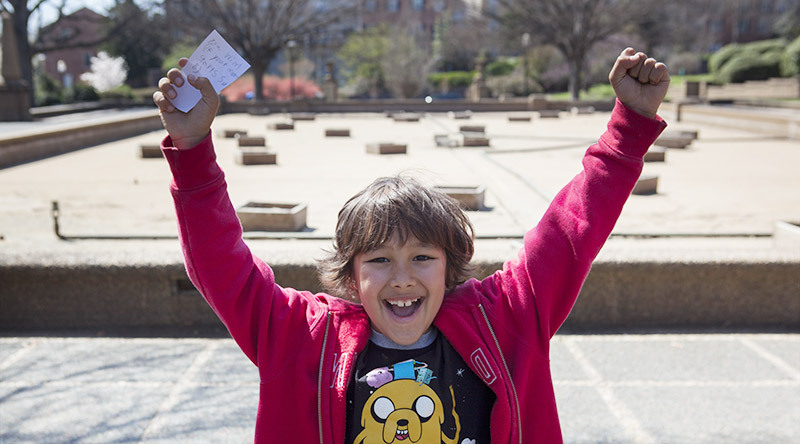 Cities want to hold on to them by becoming more "playable," for both children and adults." "As children age, families are less likely to live in cities; 42% of married couples whose youngest child is less than one year old live in city centers, according to an analysis of Census Bureau data by Joe Cortright, principal economist for Impresa Inc., a consulting firm based in Portland, Ore. That figure drops to 28% when the youngest reaches age 10. The main culprits: concerns about safety, the lure of more space and the poor perception of urban schools, according to a 2008 report published by CEOs for Cities, a national network of over 600 urban leaders. But, the report adds, "cities are becoming more vibrant and livable." 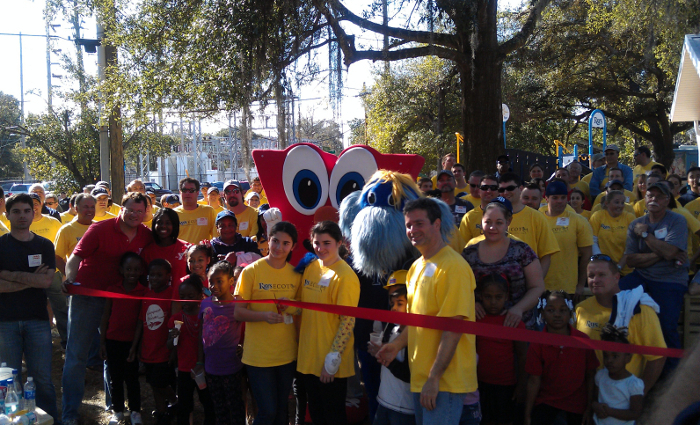 At KaBOOM!, we couldn't agree more that play is the answer to retaining young families. So much so that we've coined a word to describe the extent to which a city makes it easy for all kids to get balanced and active play. We call this playability. We understand for communities to thrive, they need to ensure that all of their residents are happy, healthy, and contributing to their community's overall vitality. One essential ingredient in the recipe is a renewed commitment to fostering family-friendly, kid-friendly environments that allow young people to get their bodies moving and their minds engaged no matter where they are. When cities make a commitment to playability, they are not just contributing to the wellness of their communities. They are strengthening the competiveness of their economies— sustainably, cost-effectively, and playfully. "Cities have every reason to want professionals to stick around. As people age and have children, their value to communities grows, both in spending power and taxable income, says Candace Damon, vice chairman with HR&A Advisors, an urban-development consulting firm based in New York. Average income for householders from ages 35 to 44 is 28% higher than for those ages 25 to 34, according to Census Bureau data. As people age and have children, Ms. Damon adds, they also tend to care more about their community. "People don't get civically engaged until they are relatively settled in their personal lives," she says. "They care about schools, they worry about potholes and the ambulance going too fast." If cities don't retain that 30-and-up demographic, "then you don't have people who are going to care and ensure they remain good places to live." Kids and parents are calling out for play everywhere. People don't just want great parks and playgrounds; they want a complete reimagining of what our urban spaces and places look like—from sidewalks to bus stops and parking lots. KaBOOM! urges cities across the country to answer this call. Congratulations to the cities of Chicago, Oklahoma City, Baltimore, and Phoenix for prioritizing play in their communities and being highlighted in the article. 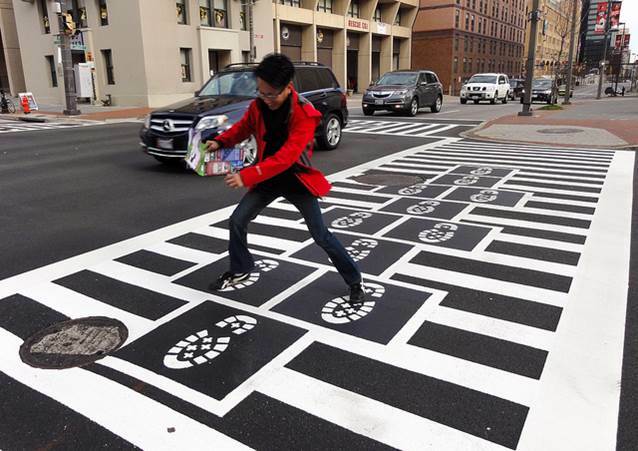 To find out what other cities are doing to become more playable visit playfulcityusa.org. What is your city doing to create a more fun and playful environment? Share your comments below or join the conversation on social media using the hashtag #playability. At KaBOOM!, we believe that the well-being of society begins with the well-being of children. This is why we’re such big advocates of balanced and active play, which is essential to enable children to thrive. Yet, as Gretchen Reynolds writes in a recent article “This Is Our Youth” for The New York Times Wellness blog, far too many of today’s children are not getting the play they need to thrive. 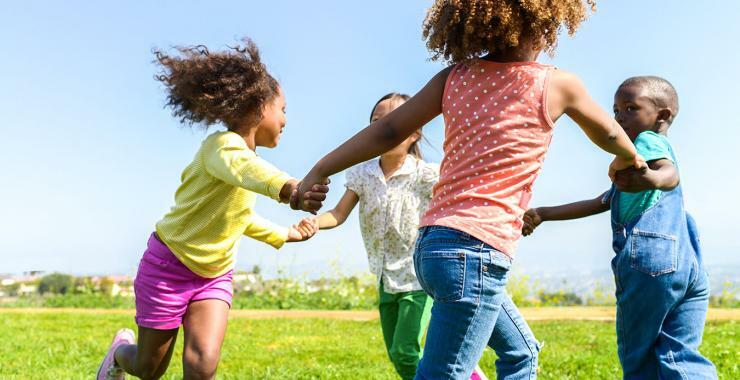 A new study from the Centers for Disease Control and Prevention has found that America’s kids, across all ethnic groups and socioeconomic circumstances, are becoming less healthy with every passing year. Only 42 percent of the children who participated in the study were as fit as they should have been given their age, and kids’ average fitness has declined by about 10 percent since 2004. Unfortunately, this is not entirely surprising: today’s children play less than any previous generation. Declining recess, a lack of safe places to play, overly-structured schedules, too much focus on one activity, and too much screen time have all replaced balanced and active play. Janet Fulton, a lead CDC epidemiologist who oversaw the new study, says that “kids who are less fit when they’re young are likely to be less healthy when they’re adults.” In other words, the play deficit threatens to create a vicious cycle from childhood through adulthood. Behaviors take root in the context of relationships, and families are arguably the most important relationship for driving healthy behaviors. Along with fostering improved health, adults can unleash kids’ creativity and encourage them to take on age-appropriate challenges through play. Ultimately, no matter their beginnings or background, all kids need balanced and active play. Caring, engaged adults are essential to ensuring kids get the play they need to thrive. The 2014 FIFA World Cup final is quickly approaching. Over the last few weeks, world-class players from 32 countries met in Brazil in the hopes of winning one of the most esteemed competitions in sports. For many, watching the World Cup is a family affair and parents may wonder whether it’s a good idea to get their kids involved in sports at an early age. That’s a great idea – running and kicking get legs moving and hearts pumping! Just remember: balanced and active play is essential for kids to thrive. As David Epstein writes in The New York Times, “we should urge kids to avoid hyper-specialization and instead sample a variety of sports through at least age 12.” At KaBOOM!, we define balanced and active play as developing active minds, active bodies, and being active together to realize all of play’s benefits. Just as a healthy diet balances proteins, fats, carbohydrates, and other nutrients, a balanced “play diet” should include a mix of all kinds of play, because different types have different benefits. For example, by playing sports like soccer, a child fulfills the active body aspect of balanced and active play and develops teamwork (active together) but there is little development of the child’s mind since rules are imposed. On the other hand, children who engage in unstructured playground and street games tend to build off loosely established rules and invent their own as they go. For instance, part of the appeal of skateboarding is its spirit of invention, imagination, and self-expression – all of which are crucial to the holistic development of a child and fulfilling the active mind aspect of balanced and active play. Every child should have the opportunity to various forms of play in order to realize all of its benefits. Because play — in all of its forms — is a powerful thing. From addressing obesity, and improving mental health and wellness, to building a creative and successful workforce – balanced and active play lays the foundation for a skilled, healthy, resilient, and successful society. 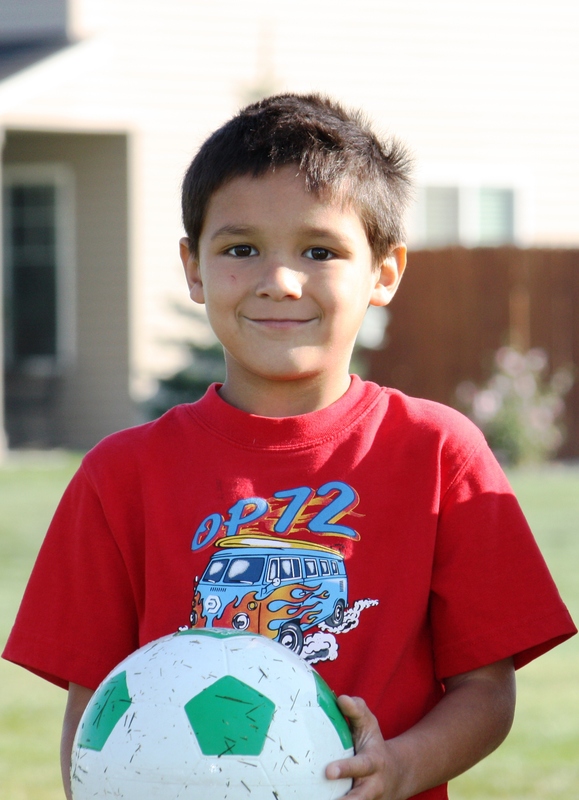 Tell us how you ensure the kids in your life get the balanced and active play they need to thrive! Leave a comment below.